The Dundas Memorial Lecture Series features significant new scholarship on the history of Australian art. To mark the centenary of Sidney Nolan’s birth in 2017, Dr Paula Dredge, the Gallery’s head of painting conservation, will present her major research project on Nolan’s UK studio, which has recently been opened to the public for the first time since his death in 1992. In this lecture, Paula will reveal exciting new evidence about the iconic Australian artist’s painting techniques and materials, as well as insight into the extraordinary legacy that is preserved inside Nolan’s studio. Paula Dredge was awarded her doctorate in 2013 from The University of Melbourne’s Centre for Cultural Materials Conservation (now known as the Grimwade Centre). Her thesis focused on the analytical and historical study of the household paints used by Sidney Nolan from 1939 to 1953. As a leading conservator of Nolan’s paintings, Paula’s study continues in the year of Nolan’s centenary. The project encompasses the following four decades of his practice through a research residency at Nolan’s studio 'The Rodd’, located in the English countryside of Herefordshire. The research residency was supported by Rowena Danziger AM & Ken Coles AM, The Gordon Darling Trust and the Sidney Nolan Trust. 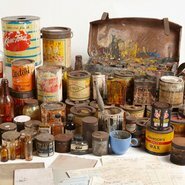 Image: Materials from Sidney Nolan’s studio, Art Gallery of NSW artist archive.